The medieval town of Zvecan is located in the vicinity of the mouth of the Sitnica in the Ibar, near Kosovska Mitrovica. It is located on the rocky cone hill and by its position it dominates over the valley in which important caravan routes crossed. It is not known when it was built. It was mentioned for the first time in connection with the border clashes between Serbs and Byzantines on Kosovo Polje (Kosovo Field) between 1091 and 1094. There is also an inscription that Stefan Nemanja, after the victory over the Byzantines in 1170, ordered that a prayer for the successful outcome of the battle be held in the church of St. Djordje at Zvecan. By the end of the 14th century, Serbian rulers frequently changed at Zvecan. From mid-15th century the Turkish army occupied it occasionally until the 18th century when the fort was deserted. The base of the Zvecan Fort is adjusted to the terrain and has an irregular stretched shape. On the highest spot, i.e. the Upper Town, there are remains of the church of St. Djordje, cistern and the main octagonal tower. There are several buildings of unclear use in the Lower Town. The ramparts of this part of fort are fortified by massive towers and the main entrance to the town was on the western side. Minor archeological excavations and conservation works were carried out in the 1957-1960 period. The church of Bogorodicni Pokrov (Virgins Omophor) at Boljetin is better known as Sokolica, named after the hill at whose foot it is located. It was built in the 14th or 15th century probably by a landlord from the surroundings of the town of Zvecan. It got the rank of monastery probably thanks to the sculpture of Virgin Mary with Christ which was brought there from the western portal of the Banjska Monastery in order to hide it from the Turks. The cult of Sokolica Virgin has always enjoyed a great reputation among the people, regardless of their confession. A spacious priprata was subsequently added to the church of small dimensions, while a belfry was built between the two wars. It was built with the neatly cut stone, with shallow semi-ovally arched apse. The facades, the northern one in particular, have many inscriptions presenting primitive drawings of people and animals as well as old inscriptions. Although the wall paintings were severely damaged during the Turkish rule, several representations have been preserved: Christ Pantocrator in the dome, Assumption on the western wall, Homage of Archpriests in the apse. Fragments of figures clad in laics clothes are visible on the southern wall who might be the founders. The Church keeps three old and valuable books: Russian Psaltir (Book of Psalms) from the 17th century, Zavomaje Ogledalo in Bulgarian from 1816 and the Prayer Book from 1838. The architectural repairs and conservation works took place in 1995/1996. A new konak (residential quarters) was built in the 1980s. The Monastery of Virgin Hvostanska is located at the foot of Mokra Mountain, near the village of Vrela, 20 km north of Pec. 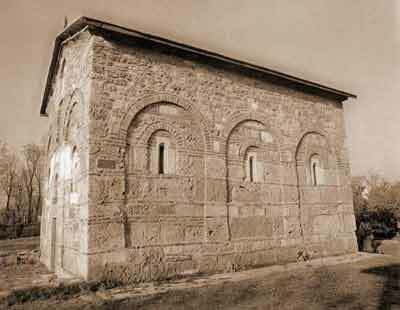 The three-nave basilica with narthex built by mid-6th century belongs the early Byzantine period. In the third decade of the 13th century, the church dedicated to the Assumption was built on its foundations where the bishopric seat was located. This was an one-nave edifice with the dome and altar apse, semi-circular inside and rectangular outside. Two small churches, paraklisi (chapels built next to a bigger church used for monks prayers or as their tombs), were on the northern and southern sides of narthex and were, from the outside, masked by the flatly built surface. Two towers were erected above them which surpassed the dome of the shrine. The church belongs to the Raska architecture. In mid-14th century, it was enlarged by an one-nave building with the semi-circular apse on the eastern side and semi-oval dome. The Hvostanska Bishophry became the diocese of a metropolitan in 1381. The second part of the 16th century was the period of flourishing artistic activities in the monastery and the last Metropolit Viktor was mentioned in 1635. 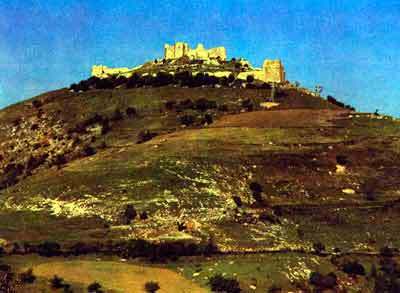 The monastery was deserted and began to decay most probably at the time of Velika Seoba (Big Migration) in 1690. 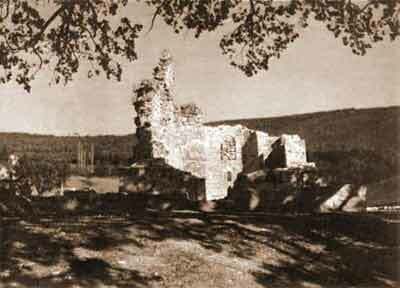 The ruins of the monastery complex were explored in 1930 and from 1966 to 1970 when conservation works were carried out on the remains of church, konak and a part of the fortification. The Gorioc Monastery (Gorioca, Ogorioc), metoh (church or monastery given as an appendage to a large monastery) of the Decani Monastery with the Church of St. Nikola, konak and belfry, is located on Bela Stena (White Stone) above the little town of Istok. According to the folk tradition, it was built by King Stefan Decanski and devoted it to St. Nikola as a sign of gratitude for healing his burned eyes on that place. However, since the same tradition is linked to a number of other toponymys it is not possible to establish for sure which place was really the endowment of the healed King. 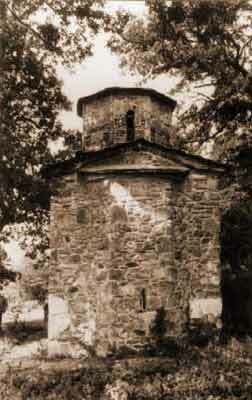 The old church of St. Nikola at Gorioc, most probably from the 14th century, is not preserved. It was renewed in the 16th and 18th centuries and at the beginning of the 20th century. The church of St. Nikola is a modest one-nave semi-ovally domed building without wall paintings. It keeps 11 icons painted during the 16th, 17th and 18th centuries. The Monastery used to keep a rich collection of Serbian medieval books, including several Serbian manuscripts from the 14th and 15th centuries which the Russian Consul and historian A. Gilferding took from the Monastery. Today, they are kept in the Public Library in Petrograd. 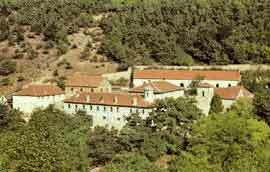 During World War Two, the Monastery was used by Albanian fascists as a prison for mass arrests of Serbs and Montenegrins. In the churchyard, konak, belfry and the fountain were restored. The little Djurakovac Church has one nave, semi-oval dome, apse which is three-sided from outside and semi-circular inside and the wooden priprata. It was built with trimmed and broken stone and limestone soaked in mortar and the roof is covered with stone blocks. It was erected on the foundations of an older building from the 14th century which is evidenced by the tombstone of a Danilo, possibly a founder, from 1362. It was completely renewed by the villagers headed by priest Cvetko in 1592 and was painted by sinful Milija zugraf (painter) as evidenced by the inscription above the entrance to the naos. The paintings are of average value for that age and were renewed in 1863. The architectural renewal also included the erection of wooden priprata with the door decorated with shallow relief with the inscriptions of the names of founders and engravers. The roofs of priprata and altar are lower than the naos and the floor of exonarthex is considerably below the level of soil. The shrine belongs to the group of cemetery churches similar to those in the Beli Drim valley and represents a rare combination of stone and wood. In its interior, imperial gates built during the transition from the 16th century to the 17th century are kept as well as four big icons from 1630 and the manuscript Bogorodicnik (the book of poems about the Virgin) from the 16th century. In the graveyard surrounding the church, in its older part which stretches to the new one, the tombstone with a deer can be noticed. Conservation works on the architecture, paintings and iconography took place in 1968.
the church was completely destroyed by Albanian militants in summer 1999, after the war. 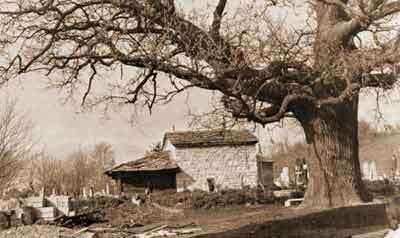 The large centuries old oak tree was cut into peaces and burned. The Church of St. Jovan, built by 1355 on the old graveyard above the village of Crkolez, is the endowment of landlord Radoslav (Jovan as monk), buried in the shrine. It was mentioned in the charter of nun Jevgenija (Duchess Milica) in 1395 by which it was confirmed that Duke Novak and his wife Vidosava presented the Church of St. Jovan as a gift to the Monastery of St. Panteleimon on Mt. Athos (Holy Mountain).The building is a typical village one-nave church with priprata and semi-oval dome. The apse is five-sided from outside and there is a modest rosette on the western facade carved in the level of the surface of the wall. The paintings from the 14th century were repainted in 1672/1673 by a new layer of the well preserved paintings painted by Serbian most famous painter of the second half of the 17th century named Radul during the rule of Patriarch Maksim. This can be seen by the fresco-inscription on the southern window. Particularly interesting is the detailed representation of the Last Judgment with many sinners, who by their social status belong to the village environment, as well as believers. The inscriptions are written in the folk language which is rare and is a special value of this fresco entity. Eight icons and imperial gates from the old iconostasis are preserved. An exceptionally valuable old collection of manuscripts on parchment and paper dating from the 13th century to the 16th century was kept at Crkolez by 1955 to be moved to the Decani Treasury. Conservation and restoration works on the paintings took place in 1972/1973. The remains of the fortified castle are located in Vucitrn, on the right bank of the Sitnica river, in the northern-western part of Kosovo Polje. According to the folk tradition, the castle belonged to Vojinovics, Serbian landlords in the 14th century. The sources state that it was the castle of the Brankovic family between 1402 and 1426 where they received deputies and released charters. At the beginning of the 15th century, Vucitrn was an important town with the colony of merchants and business people from Dubrovnik. Turks conquered the town in 1439 and, with a short interruption, held it by 1912. The fortification has the square foundation. The preserved remains of ramparts are high even up to 6 m. There is a tower only in the centre of the eastern rampart and it is known as Vojinovics Tower. It has square foundation and it is built with trimmed stone arranged in regular horizontal rows. The wooden staircase at the level of the first storey led to its interior. 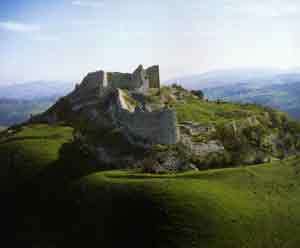 The fortified castle in Vucitrn has not been explored and no conservation works have taken place there. The hardly accessible crest near the village of Dobra Voda (Unjemir) over the Klina river is most probably the place where ascetic Petar Koriski became a monk in the 13th century. An one-nave stone church of St. Petar and Pavle as a metoh of the Decani Monastery was erected there in the 1340s. It had the dome on free columns and the pairs of built semi-circular niches on the lateral walls. Sculptural ornaments of stone basis and capitals in the late Gothic style as well as the way it was built testify that it was built by coastal masons. Painted fragments of three standing figures are enough to claim that they were painted by the painters of such stylistic orientation that represents the paintings of the Decani church. During the great renewal in the second half of the 16th century the old church was converted into priprata and enlarged by a modest one-nave church with semi-circular apse, while a spacious storeyed exonarthex was added on its western side. Wall paintings decorated only the apse and lunettes. At a certain period of time, a monastery was built around the church which is evidenced by the remains of massive walls, towers and entry gate. This magnificent edifice with the layers representing many ages is today in ruins and minor conservation works took place in 1966-1967. Today, a small church is located in the centre of the village dedicated to popular skoropomocnica (one who helps immediately) St. Paraskeva. Its outer facades are mortared. The Church has the stone socle of the roughly arranged stone and the two-guttered roof covered with stone blocks. The one-nave shrine with undivided space is vaulted by the semi-oval dome along its length. The alter apse having the outer irregular semi-circular shape represents from within a deep semi-circular niche which took over the function of the holy throne. Djakonikon (right part of the altar) and proskomidija (left part of the altar used for the preparation of liturgy) have niches of rectangular shape on the walls along its length besides semi-circular niches on the eastern wall. Two narrow windows - one on the southern and the other on the apse wall - provide light to the interior. Wall paintings are preserved only on lower surfaces including - besides the standard altar contents - the socle zones, standing figures, frieze with saints busts on medallions and the scenes from the cycle of Great Holidays with added chosen pictures from the cycle of Christs suffering. As to the style, the frescoes show a sure drawing and the variety of colours and since they are technologically at an enviable level they were the work of an experienced art workshop. Since there are no historical data about the church, it is dated back to the 1570s on the basis of the characteristics of the wall paintings. It is located in the spacious churchyard beside the village graveyard. The one-nave building was successively enlarged by priprata and belfry. This small church vaulted along its length was certainly built in the second half of the 16th century. The apse, semi-circular by shape from outside, is a niche inside. The church has no wall paintings. The priprata is a spacious building with rectangular foundation and is somewhat lower than the church, has semi-oval dome, is lit from a southern narrow window and has the entrance on the west. It has the completely preserved wall paintings from 1602/1603. The standard but exceptionally rich contents includes chosen Serbian saints, holy warriors and doctors in the zone of standing figures, developed composition of the Last Judgment, ten scenes from the cycle of Christs suffering and the same number of. scenes from the cycle of Christs activities and miracles as well as the decorations on the top of the vault. A large group of villagers as a collective founder did not succeed in engaging a talented painter so that the narrative wall paintings of the Kijevo priprata has careless drawing and unskillful composition. However, some rare iconography details deny the judgment about their self-taughtness. A solid storeyed belfry was built in front of priprata in the 19th century. Today, the church continues to keep the important collection of chronologically and stylistically different icons. The village as the collective founder built this shrine with priprata and one-nave semi-circularly domed naos around 1600. Naos is separated from the altar space by a pair of pilasters linked by a semi-circular arch between which there was the iconostasis partition. Although the apse is constructed as a deep niche, its outer shape is semi-circular as usual, while the niches of prothesis and djakonikon are constructed within the width of the wall. There are no windows on the northern wall and the windows on the southern and eastern walls are high and narrow from the outside. The simple wall surface of trimmed stone is decorated only by a spacious niche on the southern facade of the priprata. Fragments of wall paintings dating back to 1601/1602 are preserved mainly in the zone of standing figures. Detailed presentation of the Last Judgment on the western wall of priprata stretches partially to the longer walls. Bright colours, sure drawing and inclination towards decorativeness are most prominent on the horse presentations of St. Georgije and St. Dimitrije in priprata and the basic characteristics of painters who decorated the temple. After being in ruins for a long time, conservation and restoration works were carried out in 1968 and the church assumed its original shape. At least three construction phases can be recognized among the remains of a big temple at Pogradje called by the villagers St. Vraci (doctors who healed free of charge). The oldest part is the church in the narrow sense of the word - one-nave naos with arches leaning against the longer walls and the apse preserved in traces. The priprata built subsequently has almost square foundation and is preserved to the height of the beginning of the dome. The remaining wall paintings present unmarked standing figures of saints in the richly decorated clothes. Although small, the fragments lead to the possible conclusion that they were painted by the same painters who painted in the nearby Lower Church, so that this phase could date back to the second half of the 16th century. The third construction phase is represented by the part of wall with rectangular niche leaning against the western corner of the northern facade of priprata. Since the wall has not been archeologically explored, nothing can be said for certain about its original shape and use. 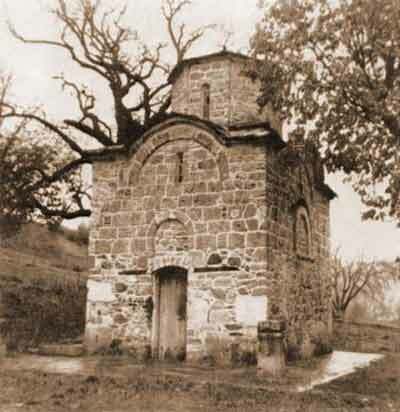 The cemetery church, today dedicated to St. Vraci Kuzman and Damjan, most probably originally had St. Nikola as its patron, while, subsequently, the villagers gathered there on the holiday of St. Dimitrije. Modest one-nave and semi-ovally vaulted space is without priprata and with semi-circular niches which mark the prothesis, altar apse and djakonikon. From the outside, the altar apse is semi-circular. The only entrance with arch and lunette is on the western wall, while the three remaining facades have a small window without ornaments. The architectural characteristic of this church is the elevated floor to the level of sole (elevated part in front of the altar) by one stair. The preserved fresco fragments indicate that the approximate time of its building can be considered the second half of the 16th century. Today, wall paintings include the zone of standing figures and some compositions from the cycle of Great Holidays. As to the style, drawings and the bright colours of paintings are of a standard quality and indicate to the average talent of an anonymous painter. Having been ruined for a long time, the church was renewed during extensive restoration works in the 1964-1967 period, domed and covered with two-gutter roof with stone blocks, while the wall paintings underwent conservation and were cleaned from the layers of soot and salt. The medieval settlement of Cabici was the biggest village of the Decani estate mentioned in hrisovuljas (official documents with a gold seal) in mid-16th century. A modest, one-nave, semi-ovally vaulted church built with trimmed stone and covered by stone blocks on two-guttered roof was erected there at the end of the 16th century or at the beginning of the 17th century. The only ornament decorating the eastern and western facades is a slightly raised arch marking the contour of the dome. The altar apse is three-sided from outside and semi-circular in its interior, while proskomidija and djakonikon are replaced by the pairs of niches. The iconostasis was built subsequently with two passages to the altar. It was built to the height of the dome and had icons on a board. There is one narrow window on the apse and on the southern wall. The interior is decorated by frescoes with the repertoire which, above the zone of standing figures, represents the cycles of Great Holidays and the lives of patrons. Judging by bright colours, insecure drawing and miniature proportions of figures, the paintings were painted by a painter of modest talent, more inclined to iconography, in the first decades of the 17th century. Icons, which were kept in the church until recently, are of higher artistic value than the wall paintings. Priprata which was built subsequently is today in ruins. Architectural conservation works and the cleaning of paintings were carried out in 1968. The church is located 15 km east of Novo Brdo. It was built and painted in 1354/1355 and its founder was Serbian landowner Dabiziv with his brothers and parents. Even three inscriptions are preserved (two carved in stone and one in fresco technique) which provide basic information about this endowment of modest dimensions. Naos is one-nave, vaulted, with semi-circular altar apse and niches marking proskomidija and djakonikon. A high priprata was built next to the western wall for which it is supposed that ended as a tower or a belfry. The church was in ruins for a long time, so that the paintings are severely damaged. In naos, only the fragments of the Service of Archpriests, several standing figures and the composition from the cycle of Christs suffering are preserved. Standing figures are recognizable on the southern wall of priprata, busts of sufferers are painted in the medallions in the second zone and above them there is the scene of St. Djordje saving the Emperors daughter and most probably the portraits of founders. The compositions from the cycle of Virgins life are presented in the highest zone of wall paintings. Certain interventions were carried out on frescoes in the 16th century, while the Virgins temple in Vaganes was almost completely razed to the ground in mid-19th century. Conservation works, carried out in 1963, restored its original appearance only partially. Do the impressive remains of the trikonha monastery church and the complex around it herald the birth of the Morava style and date back to mid-16th century or are they one of representative examples of architecture in the period of Turkish rule in the Balkans? The literature of a recent date is trying to solve this problem using the arguments of similar weight, but the problem has not been solved yet. On the basis of historical sources the only thing known for sure is that Patriarch Pajsije, born in the vicinity, returned, intended to give and endowed manuscript books to this monastery in mid-17th century. 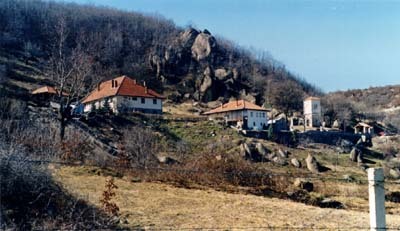 The remains of the monastery are surrounded by the pleasant landscape beside the village of Mocare, north-east of Kosovska Kamenica. Partially explored, the complex consists of the monumental church dedicated to Virgins Vavedenje, dining room with cellar west of it, two several-storeyed angled towers and buildings with porches which probably served as monks cells and which stretch to the north and south along the churchyard. The covering of walls with the neatly cut stones, decorative use of brick (like cells with the use of stone on residential buildings or in the shape of fishbone on the western facade of the church) and the interwoven stone relief ornament are the characteristics of this architecture. The church itself, without priprata and with narrow west cross beam and regular konhas, had originally the dome leaning on free columns. Partial excavation and conservation works took place in the 1963-1966 period. In the vicinity of Gnjilane, 1 km south-east of the village of Kmetovce, there are the remains of the church of the old monastery of St. Dimitrije, today more known as dedicated to St. Varvara. Written sources do not mention this cult place, while the folk (oral) tradition links the birth of the monastery with the time of Emperor Dusan. The preserved remains of church indicate the transitional type of building between the developed (pure) cross and the shortened cross which points to the similarity with the shrine of St. Nikola in the Holy Archangels Monastery near Prizren. One-nave vaulted building with the dome over the central cross bean was leaning on the wall between priprata and naos on the western side, while on the eastern side it was supported by two columns. As to the altar space, the apse, three-sided from outside, and the niche which marked proskomidija are preserved. The church was built with stone with the modest use of brick. The remains of fresco decorations - fragments of ornaments and the busts of saints on red background - are visible in the northern-eastern corner of the shrine. Stylistic characteristics, both artistic and architectural, lead to the conclusion that it was the endowment of a landlord, most probably from the sixth decade of the 14th century. 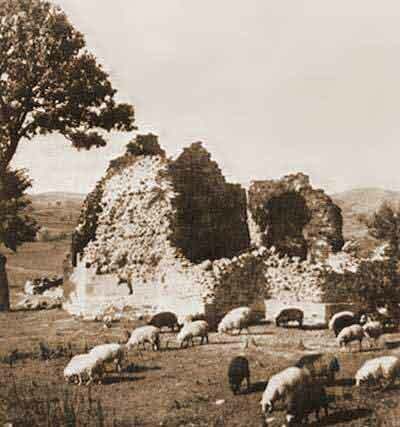 The church was partially ruined after the Kosovo Battle and completely demolished in the 18th century. Conservation works were carried out between 1966 and 1968. In the Metohija region of Drenica near Srbica there is a monastery with church dedicated to Virgins Vavedenje. Its present appearance is the result of many changes and enlargements during five centuries so that it is difficult to determine its original appearance without any excavations. The church itself is certainly the oldest part of the complex. It is an one-nave building covered with lateral semi-oval dome, with the three-sided apse from outside. A spacious paraklis was built next to its northern facade in which the fragments of frescoes from the second half of the 15th century are preserved. The tomb of ascetic Joanikije Devicki (died in 1430), a local saint who secured the status of the cult place to the monastery, is in a separate small paraklis which is leaning against the eastern wall of the church and northern paraklis. After its renewal in 1578, undertaken thanks to Prior Pahomije and monk Longin, the church and paraklis were painted. Fragments of the paintings painted at the time are preserved in the churchs apse as well as above Joakinijes tomb where the presentation of the Ascension is the most evident testimony to the inventiveness of the painter. The reputation that the monastery enjoyed in the 16th and 17th centuries due to its saints relics was increased by its fruitful transcription school. The fact that it managed to be active also in the 19th century is evidenced by oil wall paintings painted after its renewal in 1863. It was destroyed during World War One and World War Two and renewed in 1950 and returned to active monastic life. In the vicinity of Decani, in the centre of the village of Locane, there is a log cabin built most probably in the first decade of the 18th century. Its age can be determined on the basis of the folk tradition which says that the first fire in the Decani Monastery was brought from the fireplace of this cabin. It is built on the flat terrain, it has the rectangular foundation and a porch, four-guttered roof covered with tiles. It was built in phases, enlarged by a room and a store room to the original one-space log cabin intended for the residence of people and the accommodation of livestock. By its enlargements, it was converted from the archaic plain cabin to a peasants house. 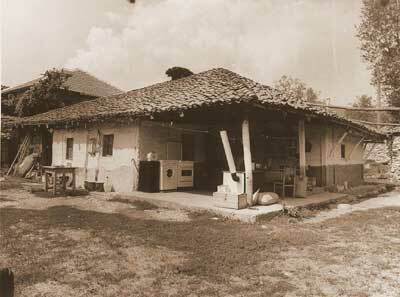 By reminding, originally, of the biblical concept of residence and, after its conversion, of the process of transforming rayah into peasants, Danilovics log cabin, as the oldest preserved cabin in Serbia, represents the testimony to the social and historical events and the position of the Serbian people in Kosovo and Metohija endangered by the violence of foreign, heterodox and aggressive Albanian settlers, which also found reflection in the said folk tradition as the confirmation of its age, i.e. the long-standing existence of Serbs in this territory and their rights to it. The log cabin is still functioning today. Despite its exceptional value, no conservation works were carried out. The one-nave semi-ovally domed church dating back, on the basis of its architectural characteristics and paintings, to the end of the 16th century or the beginning of the 17th century is located on the village graveyard, on the terraced plateau falling sharply towards the river bank. It will never be possible to determine when it was built since the founders fresco inscription is damaged. The narrow interior, lit by one window on the south and east, has only semi-circular niches of the altar and prothesis. The altar niche is three-sided from outside and the northern facade surface, with no openings, has two niches. The preserved paintings indicate that they were used for prayers so that they have - as fresco icons - the down-to-the-waist representations of Holy Archangel Mihail and St. Petka. The well preserved whole of wall paintings inside the church is the work of an unknown painter of sure drawing and inclined to narration so that he managed to present the full usual contents without summarizing it in this small temple. Judging by the preserved icon of St. Varvara, he most probably painted the icons for the altar partition. The church was enlarged by the poorly built priprata with wooden belfry over it. Minor architectural conservation works took place in 1959-1960. The history of the cemetery church of St. Djordje at Gornje Selo (Upper Village) is not known, but its architecture and paintings belong to the 1570s and the first decades of the 17th century. The church consists of three successively built units. The eastern one is the oldest - the original one-nave semi-ovally vaulted temple with the altar and prothesis niches. By pulling down the western wall naos was extended and expanded and two entrances in the church were made, one from the west and the other from the south. A stone shallow-relief tablet with the blooming cross and two birds on it is above the southern entrance. The third phase is represented by priprata with wooden domed belfry. Paintings are preserved only in the oldest part of the church, on its three remaining walls. Stylistically very similar to the paintings at Bogosevci and Gotovusa from the Sirinic district, wall paintings are attributed to the same painters characterized by narrativeness, free drawing and live colours. Shallow and semi-circular apse is the characteristic that, architecturally, differs the Drajcici church from other churches belonging to the Sredacka group. It is also interesting that this one-nave semi-ovally domed edifice has the floor with stone tiles lower in naos and elevated at the level of sole and the altar area. The southern facade has a semi-circular niche with the down-to-the-waist fresco painting of an archangel. The period of the described first phase of the construction of the church is determined on the basis of paintings as the last decade of the 16th century. The original appearance was changed by the removal of the western wall and the significant extension of naos in the 1630s. In addition to architectural changes, the restoration also implied the repainting of the church so that the new paintings covered or replaced almost the entire old ones. The quality of the original wall paintings can be judged today only by the icons preserved in the iconostasis in the throne series and the frieze making the Deizisni cin (three icons representing the Crucifixion, St. Jovan and the Virgin) which is supposed to be the work of the same painter. Characterized by sure drawing and the noble colours, these works are the expression of a mature painter who, by wide strokes, defined the form and achieved magnificence that lacks in other painters from the same region. Conservation works on icons were carried out in 1960-1961. The church originally dedicated to the Holy Apostles Petar and Pavle whose patron today is St. Petka is located above the village of Musnikovo. It was built and painted in 1563/1564 and extensively renewed in the second half of the 19th century. That restoration included the removal of the western wall, expansion of naos by the width of wall and its extension to the west, the enlargement of windows and the changing of the appearance of the front - instead of triangular it got a high sloping gable. The original appearance of the church shows that it was built with trimmed stone, without ornaments, and that it had an apse three-sided from outside. In the interior, only two niches necessary for rites were built, the altar and prothesis. Although only a small part of the original fresco paintings was preserved, the work of a painter who gained knowledge in one of the Cretan workshops is recognizable in the zone of standing figures on the southern wall. Besides Greek inscriptions and style, recognizable is also the rare iconography solution of the representation of St. Petar and St. Pavle in an embrace painted with the original iconostasis. Another painter from the same group who painted the altar is considerably less talented. During the architectural conservation works carried out in 1962 the ruined church got the dome and the two-guttered roof covered by stone blocks. At the village cemetery, there is an old church considerably surpassed, in size, by the subsequently built priprata which is wider and higher than the small church on whose western facade it is leaning. The original temple is one-nave, with undivided space, vaulted by semi-oval dome and with three semi-circular niches in the altar area. Lateral niches are built in the wall, while the altar niche is three-sided from outside. The church was built with trimmed stone and its facades have one niche each. There are three narrow and high windows on the southern wall, while a window on the eastern side casts light on the holy throne. Pomenik (requiem book) inscribed beside the proskomidija niche cannot help in determining when the church was built, so that, on the basis of the stylistic characteristics of the preserved wall paintings, it is considered that the church dates back to the second half of the 16th century. The usual contents, which summarizes the cycles of Great Holidays and Christs suffering, is also characteristic for that time, while in the context of iconography the attention is primarily drawn by the representation of St. Sava Srpski, characteristic for the cap adorned with crosses. As to the style, the frescoes of this church are of a considerably poorer quality in comparison with the works of an unknown group which painted the nearby church of the Holy Apostles. The fortified town of Kaljaja is located above the present-day Prizren, on the hill of great strategic importance. The ramparts of the fort are parallel with the edge of hill - the foundation has the shape of irregular ellipse, 190 m x 150 m. The main entrance to the fort, divided into the Upper and Lower Town, was on the western rampart. The Upper Town encompassed the elevated area in the southern-eastern part of the fort and was protected by separate ramparts stretching to the west and north. The Upper Town was entered through the gate in the western part of the internal rampart. Since it was used for centuries, the fort changed its masters several times who pulled it down, repaired and enlarged it. Archeological excavations indicate two main periods of construction (medieval and Turkish), each having several phases of development. 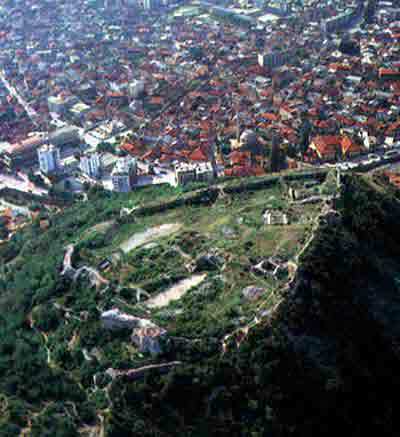 The medieval period consists of three phases: Byzantine Prizdrijana from the 11th century, the period of the 12th and 13th centuries and the objects built at the time of the rule of Emperor Dusan (southern tower, internal rampart, part of the eastern rampart to the underground passage and lower parts of the western rampart). The Turkish period consists of five phases and most objects belong to the second one dating back to the 17th century. These are: southern town, vaulted corridor built next to the southern rampart of the Upper Town, upper parts of the western rampart of the Lower Town with the main gate, eastern rampart with semi-circular tower and the underground passage leading to the Bistrica river. The small church of landlord Dragoslav Tutic (Nikola as monk) and his wife Bela is located in the centre of the present-day Prizren. According to the stone inscription, preserved only in fragments but of known contents on the basis of the transcript from the 19th century, it was built in 1331/1332 and most probably painted immediately after that. Subsequently, it became a metoh of the Decani Monastery. The one-nave church is of small dimensions, surpassed by the dome of octangular tambour with windows. A semi-circular apse with two semi-circular niches for proskomidija and djakonikon is on the eastern side. It was built simply with stone and brick. Not many paintings are preserved. According to the subjects, arrangement and style, fresco paintings are related to those from the first phase of the church of St. Spasa and in the church of St. Djordje at Recani, so that it is considered that one workshop painted all three shrines. The same painters are considered to have painted two icons - Virgin Odigitrija from the iconostasis of Virgin Ljeviska (in Saborna Crkva (Cathedral) in Prizren) and the dual Ljubizdon icon with the Annunciation and the Meeting between Ioakim and Anne (in the National Museum in Belgrade). Conservation and restoration works on architecture and paintings were carried out in the period between 1967 and 1970 when the entire dome underwent restoration. At the hamlet of Pejcici, today north of the highway, there is the biggest but also the youngest church in the group of churches of the Sredska district, dedicated to the Holy Virgin. One-nave, semi-ovally domed temple, with the altar apse which is shallow and three-sided from outside and in the shape of niche in its interior, had been probably built several years before it was painted, i.e. in 1646/1647. It was built thanks to the contributions of a great number of villagers whose names are mentioned in the founders fresco inscription. The well preserved paintings include the zones of standing figures, saints busts in medallions, compositions of the cycles of the Suffering and Great Holidays arranged in two separate columns and the standard decoration of the altar and dome areas. With the gamut reduced to colour and the prominent drawing, the paintings of this church are rather illustrative than having artistic value. In the second half of the 19th century, a square storeyed priprata and a light wooden belfry above it were built in front of the church. In the middle of the village of Sredska, by the village road, there is a miniature church for which the villagers say that it was a family chapel and which is certainly the oldest and the most interesting monument of this district. This status of the church is ensured because of its simple architecture (one-nave foundation with the apse hardly rounded from outside, semi-oval vault and exterior dimensions of little over 5 m of length and 3 m of width) and the exceptionally high quality of its frescoes. An unknown painter did not pay any attention to the dimensions of the building and, already in the first zone below the painted arcades, he painted monumental and exceptionally modelled figures of holy doctors and holy warriors clad in lively aristocratic garments. He painted the homage to the lamb and Virgins bust with angels in the small altar niche and archdeacon Stefan in the prothesis niche. The light translucent colours and the inclination towards decorativeness contribute to the fact that, out of the previously offered years in the literature, we accept the year of 1530 as the most acceptable. Finally, it should be added that these frescoes attract attention also because of the painting technology since they were painted on the mud mortar with coarse chaff. The church of St. Jovan is located on the elevation near the eastern entrance in Velika Hoca. It was probably built in the 14th century which is confirmed only by fragments of frescoes from that time. Architecturally unusual, the church has the shape of tetrakonhos with square priprata. Lateral apses are lower than the ones on the east and west. Naos and priprata are covered with semi-oval vault. The apses are polygonal from outside and semi-circular inside. In the 1580s, the church was repainted. The altar area has the paintings of Virgin Mary, homage of archpriests, communion of apostles and annunciation, while in the first zone standing saints are printed and in the narrow column above them there are down-to-the-waist representations. The cycles of Great Holidays, Christs suffering and Virgins akatist are painted in higher zones of the temple. Iconographic contents of the paintings in priprata, with the interesting choice of scenes, emphasizes the message of prayers to Christ. On the eastern wall of priprata in the Deizis composition, Virgin Mary and St. Jovan Krstitelj (Baptist) address prayers of the human race to Christ to be a mild judge on the Last Judgment painted on the western wall. The portrait of St. Jovan is painted in the niche above the entrance in naos, while the scenes from his life are illustrated in higher zones of priprata. Conservation works on the paintings were carried out in 1975. The church of St. Nikola, at the graveyard above the village, was built and painted by 1345. In that year, nun Marta was buried in that church, mother of landowner Gradislav Susenica, which is inscribed on her tombstone. It is supposed that the temple was built by the parents of landowner Gradislav in the second quarter of the 14th century. The church is an one-nave building covered with semi-oval cupola, with the apse three-sided from outside and semi-circular inside. The wall between priprata and naos was removed. Part of the original wall paintings is preserved only on the western wall which, by its style, belongs to the time of King Dusan. It is supposed that the founder of paintings was Gradislav Susenica himself. The scenes of the cycle of St. Nikola include, inter alia, the composition of St. Sava and St. Simeon Nemanja bowing to the icon of Virgin Mary with Christ. After the renewal in the 16th century, the church was repainted. Above the zone of standing saints, there are busts in medallions and the cycles of Great Holidays, Christs suffering and St. Nikola, while the Virgins akatist, Christs miracles and parables and the Last Judgment are illustrated in priprata. Conservation works on the paintings were carried out in the 1970-1975 period. 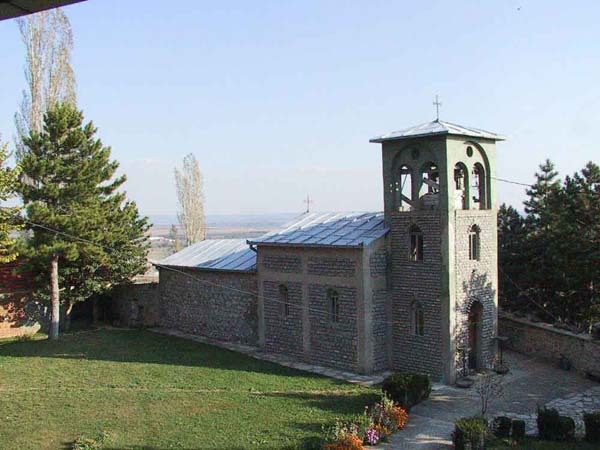 In the village of Recane, east of Suva Reka, there is a small church dedicated to St. Djordje, the endowment of an unknown Serbian duke who was buried there on 23 December 1370. The tomb with the carved, partially damaged, inscription points to the period of the construction and painting of temple as the seventh decade of the 14th century. The building has unusually harmonious proportions and the foundation in the shape of the shortened cross with the dome on pilasters. It was built with stone; only the dome is built with alternate layers of limestone and brick. Modest ceramoplastic decoration is represented primarily on the southern facade. The interesting iconographic contents of the Recane paintings includes, besides the usual subjects, the cycle dedicated to the patron of the temple numbering about ten compositions based on the Slav interpretation of the legend about St. Djordje. The stylistic characteristics of these paintings, severely damaged by fire and the temples partial falling in mid-19th century, point to local painters, members of a local workshop, most probably from Prizren. Inspired by the achievements from the first half of the 14th century, they show some archaic characteristics but, at the same time, certain features characteristic for the contemporary trends and for the art of that time. The first protection works were carried out already in 1926, while the complete conservation works on the architecture and paintings were carried out in the 1956-1960 period. The church of St. George was destroyed by explosive in June 1999 after the end of Kosovo war by Albanian extremists. The ruins of the church have since then mostly been removed from the location where this beautiful example of 14th century architecture once stood. The historical area of the Kosovo Battle which took place in 1389, i.e. 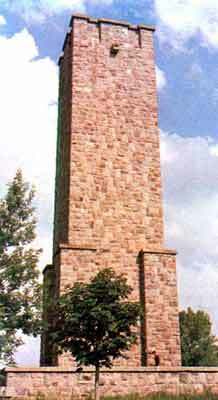 the central place of clash between the Serbian and Turkish armies, is a unique whole consisting of the monument to the Kosovo heroes in the shape of medieval tower built in 1953 and designed by Aleksandar Deroko, and Gazimestan turbeh (Barjaktar's (flag bearer) turbeh). The area of the Gazimestan, Plandiste, Tresevina and Lazarevo memorial complex is bordering, on the north, with the Baksija area; on the north-east with the Brnjica river, on the east with the town of Donja Brnjica and the Ravniste area; on the south with the Orlovic area and town; and on the west with the Siroko Polje and Mazgit areas with the town of Gornji Mazgit. The road to Pristina on the western side is partially bordering with and partially passing through the area. 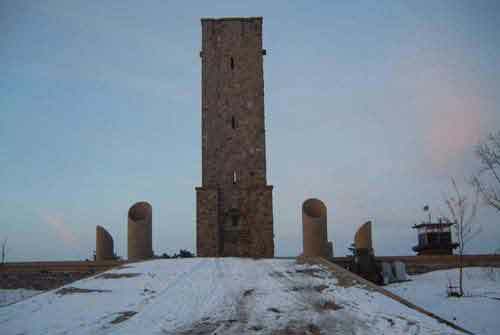 The central place is the tower, 25 m high, whose interior is inscribed by the verses of the Kosovo Cycle. There is a platform on the top of the tower overlooking the area of the Kosovo Battle. On the occasion of the celebration of the sixth century from the Kosovo Battle, art applications in cast bronze symbolizing the jubilee years were made around the tower. A white monolith marble column with the text by Despot Stefan Lazarevic was erected in the vicinity of the monument. The medieval town of Novo Brdo is located on the top of Mala Planina (Small Mountain), between Prilepnica and Kriva Reka, north of Gnjilane. The fortified town and settlement date back to the beginning of the 14th century. From mid-14th century, Novo Brdo became the biggest mining place in Serbia and the most important urban centre. Silver exploited in the Novo Brdo mines had the ingredients of gold. Besides the Serbian population, people from Dubrovnik, Saxons, Greeks and Albanians also lived in the town. At the time of Emperor Stefan Dusan, there was a mint in the town and the coins with the name of the town started to be minted in 1349. The Turks conquered the town in mid-1455 and its sudden decay began. It was completely deserted at the beginning of the 17th century. The fort is composed of the dominant Upper Town of polygonal shape with six massive rectangular towers. It was built with trimmed broken stone in almost regular layers. The rampart of the Lower Town with two towers is stretching towards west following the configuration of the terrain. The urban settlement with the main town church of St. Nikola was within the Lower Town and on a wider space east of the fort. 900 graves and tombs, built or carved in the rock, were discovered in the church and its yard. The remains of a church built by Saxons and the people from Dubrovnik, named Saska (Saxon) Church, were discovered south of the town. 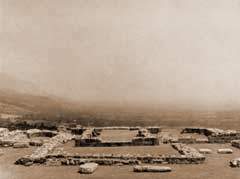 Archeological excavations and parallel conservation works in the complex of the fortified town, settlement and the church at Novo Brdo were carried out in the 1952-1959 period, in 1962 and 1969. The church of Virgin's Vavedenje was probably built in the second or third decade of the 14th century. It is an one-nave edifice covered with semi-oval dome, with the apse three-sided from outside and semi-circular inside. It is built in alternation of stone and brick and the facades are decorated with shallow sculpted ornaments and blind arcades. The built iconostasis was subsequently erected at the time of the renewal of church in the 16th century. Another partition dividing the interior of the church to the altar area, naos and priprata was also built then in the western part of the temple, while the ruined upper parts of the church were restored. The original paintings, partially preserved, were also damaged in a fire. The founder of paintings, an unknown landowner, is painted on the northern wall of naos. The paintings of high artistic value date back to mid-16th century. After the restoration of church in the 16th century, new frescoes were painted in the church and this process lasted, with interruptions, until 1621. The compositions with Eucharist symbols in the altar were renewed, individual saints' figures and compositions from the cycles of Great Holidays and Christ's miracles were painted in higher zones of iconostasis and naos, while the Last Judgment, individual saints and the healing of the sight of Stefan Decanski were illustrated in priprata. Conservation works on architecture and wall paintings were carried out in the 1955-1958 period.